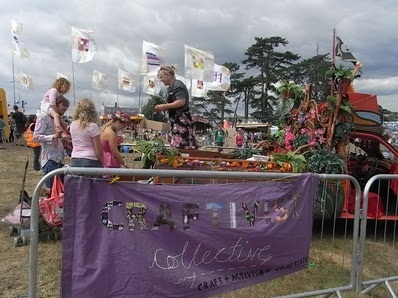 The wonderful craftivist Carrie Reichardt drove her Tiki Truck to Bestival Festival in Isle of Wight and stuffed some craftivism stuff to take with her. The truck which was decorated with mosaics made by Carrie lead the fancy dress parade around Bestival. Carrie sold some of her political mosaic tiles for the rest of the festival out the back of the truck as well as selling some Mini Protest Banner kits and postcards, getting people signing up to our mailing list and taking our flyers to spread the word of craftivism. Thanks Carrie!